By 2006, Ireland's so-called Celtic Tiger economy was still continuing apace. Fianna Fáil, the party which had claimed the most credit for the sustaining of that economy and which had won a huge election victory in 2002 as a consequence of it, was nearing the end of its second term with Bertie Ahern as Taoiseach. No stranger to the media, Ahern found himself in the news for all of the wrong reasons in the run up to the next election as his personal finances came under scrutiny. Tensions grew between Ahern and his coalition partners the Progressive Democrats over his initial refusal to provide the details of payments he received in the 1990s for speaking engagements, as well as his links to certain businesspeople. As the election campaign got underway, however, this issue eventually took a back seat to the economy. Already some economists were beginning to warn that the boom was nearing an end, although such claims were initially rejected by the government. Fianna Fáil campaigned on the popularity of Ahern, citing his record on the economy and in the Northern Ireland peace process, which was simultaneously developing further with the St. Andrews Agreement in 2006. Unlike in the previous general election, Fianna Fáil weren't even expected to gain an overall majority this time around, and the Progressive Democrats campaigned once more as the party that would "keep an eye on" Fianna Fáil in government. Fine Gael faced its first general election under new leader Enda Kenny. Having suffered a huge setback in 2002, the party had made gains in the local and European elections in 2004, and hoped to regain many of the seats it lost five years previously. Also in 2004 Enda Kenny committed his party to an electoral alliance with Labour, as the two parties did in 1973, to provide a viable alternative government to the Fianna Fáil/PD coalition. Smaller parties also hoped to make gains. 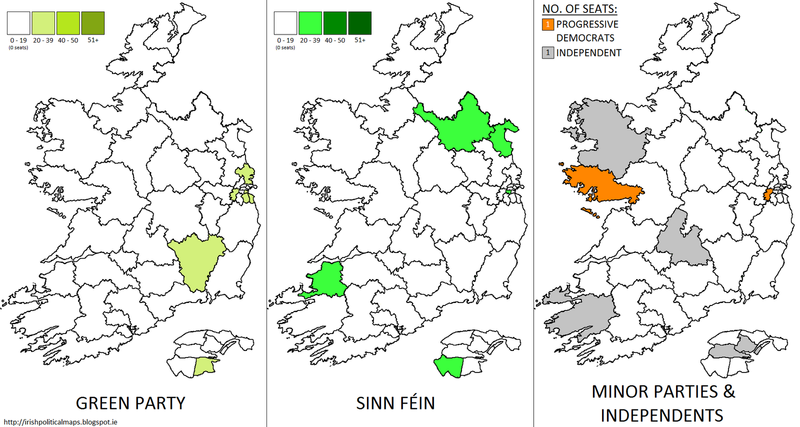 The Green Party and Sinn Féin each hoped to win new seats and increase their presence in the Dáil, while many of the independents elected in 2002 were not expected to hold their seats this time. This election saw the end of an era in independent politics when Independent Fianna Fáil TD Niall Blaney joined the party that his uncle Neil Blaney had left in 1970. Summary of the seats won by parties in 2011. Click on the images to enlarge them. 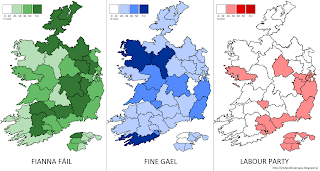 Although several opinion polls prior to the election day indicated that the Fine Gael/Labour coalition would replace the outgoing government, Fianna Fáil remained by far the most popular party, losing only three of the seats it had won in 2002. Its chances of continuing in government were put in jeapordy, however, by the huge losses suffered by the Progressive Democrats, who went from 8 seats to just 2, Mary Harney in Dublin Mid West and Noel Grealish in Galway West. Party leader and outgoing Tánaiste Michael McDowell lost his seat in Dublin South East and announced his retirement from politics immediately afterwards. Fine Gael made considerable gains, reversing the decline of 2002 and bringing the party up to 51 seats. Unfortunately for Fine Gael's prospects, their gains came at Labour's expense. Pat Rabbitte's party made no gains at all, and even lost one seat. Even with the help of the Green Party, which held its number at 6, a new Rainbow coalition was unattainable. Instead, the Greens found themselves courted by Fianna Fáil. A coalition was agreed between Fianna Fáil, the Progressive Democrats and the Green Party, which would govern until a much more game-changing election than any before in 2011. Bertie Ahern's party did very well in this election, losing only three seats from their 2002 total. The party received high shares of the vote in most constituencies - only Mayo dropped below 25%, attributable to the popularity of Enda Kenny in that area. Each of the outgoing Fianna Fáil ministers were re-elected, with former minister and outgoing Senator Mary O'Rourke returned to the Dáil in Longford-Westmeath. The Fianna Fáil vote in Donegal North East rose above 50% for the first time since the 1970s as the Blaney family rejoined the party, while the other kind of independent Fianna Fáil TD, Jackie Healy Rae, enjoyed a comfortable re-election in Kerry South. Ahern became Taoiseach for a third successive time, equalling the record held by Éamon de Valera. Although he stated his intention to remain in government until the next scheduled general election in 2012, he resigned in 2008 amidst further speculation regarding his finances. He was replaced as Taoiseach by his newest Tánaiste, Laois-Offaly TD Brian Cowen. Initially regarded as a caretaker leader until someone better came along, Enda Kenny proved his worth in this election with the restoration of Fine Gael to the twin positions of viable Opposition and viable alternative government. His popularity in his constituency of Mayo saw Fine Gael top the poll there and win three seats, a rare occasion in which a constituency had more Fine Gael TDs than Fianna Fáil TDs. Roscommon-South Leitrim and Cork South West also saw large Fine Gael gains. The party's presence in Dublin improved significantly, with new TDs such as Leo Varadkar and Lucinda Creighton winning seats there. The party failed to win seats in Dublin Central, Dublin North West, Dublin Mid West and Kildare South. As the government's popularity fell between 2007 and 2011, Fine Gael became the most popular party in the state, and by the time of the next general election it was poised to make its 2002 losses a distant memory. Although the Labour Party hoped to make gains from its electoral pact with Fine Gael, the so-called Mullingar Accord instead saw the majority of the anti-government votes go the would-be coalition leader. This was the first election in which Labour ran a candidate in every constituency. The party lost its seats in Kerry South and Dublin North, although it gained a seat in Cork South Central. Shortly after the election, party leader Pat Rabbitte announced his decision to step down. He was replaced in September of that year by Dún Laoghaire TD Eamon Gilmore, who, like Rabbitte, had been a member of Democratic Left before the 1999 merger. One positive outcome for the party was the 20.9% won in Cork East by Sean Sherlock, son of the retired TD Joe Sherlock. Although the Green Party did suffer the loss of Dan Boyle in Cork South Central, this was offset by the surprise election of Mary White in Carlow-Kilkenny, keeping their net total unchanged. Party leader Trevor Sargent took an anti-Fianna Fáil line during the campaign, and said he would not lead the Greens into coalition with Bertie Ahern's party. When the circumstances of politics led this to happen, he resigned his position as leader and was replaced by Dublin South East TD John Gormley. With the dissolution of the Progressive Democrats in 2009, the Greens became the sole junior partner in the coalition. As the economic situation worsened and the government's unpopularity rose, the Greens were often the target of much anti-government sentiment, incurring huge losses in the 2009 local elections. 2011 proved devastating for the party, as its participation in government from this election eventually resulted in the loss of all of its seats. Although Sinn Féin's vote increased marginally, the loss of Sean Crowe's seat in Dublin South West reduced their overall total to four. Regardless, the popularity of Sinn Féin was gradually increasing as power sharing in Northern Ireland came to be finalised once more and the decommissioning of the Provisional IRA was confirmed. The vote shares received by Caoimhghín Ó Caoláin in Cavan-Monaghan and Martin Ferris in Kerry North increased, as did the average share received by candidates in constituencies across the state. Votes in border constituencies increased, with Pearse Doherty just missing a seat in Donegal South West. It seemed that the growth would be a gradual one, but it would continue nonetheless. Far from their successful debut to Irish elections in 1987, the Progressive Democrats had declined considerably in popularity and status by 2007. The growing dissatisfaction with Mary Harney's tenure as Minister for Health as well as the growing perception of the PDs as offering nothing fundamentally different from the party they had always governed with led to an electoral annihilation. Only Harney and Noel Grealish retained their seats. Harney resumed leadership of the party upon the loss of Michael McDowell, temporarily transferring it to Senator Ciarán Cannon in the hopes that a renewal might be on the horizon. It was not to be, however, and in 2009 the membership of the Progressive Democrats voted to dissolve the party. Grealish and Harney continued in the 30th Dáil as independent TDs, the former winning re-election in 2011 and Harney announcing her retirement just prior to that election. It was a solemn end to a party which once looked as if it could change the political landscape of Ireland. 2007 was not as fortuitous a year as 2002 was for independent candidates. 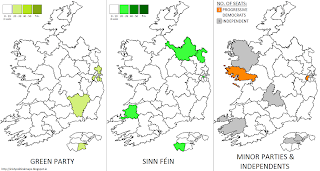 Where 13 were elected on the last occasion, only five were elected this time, the majority of them long-serving, such as Jackie Healy Rae in Kerrt South, Michael Lowry in Tipperary North and Tony Gregory in Dublin Central. Gregory died in 2009 after three decades of representating Dublin's north inner city. He was succeeded by his former election agent, Maureen O'Sullivan. In Mayo, Beverly Cooper Flynn won election as an independent. She was subsequently allowed back in to Fianna Fáíl. Finian McGrath was the sole 2002 independent to retain his seat in Dublin North Central. He, along with Healy Rae and Lowry, pledged his support to Bertie Ahern's third term as Taoiseach.